This is for you BRQ. 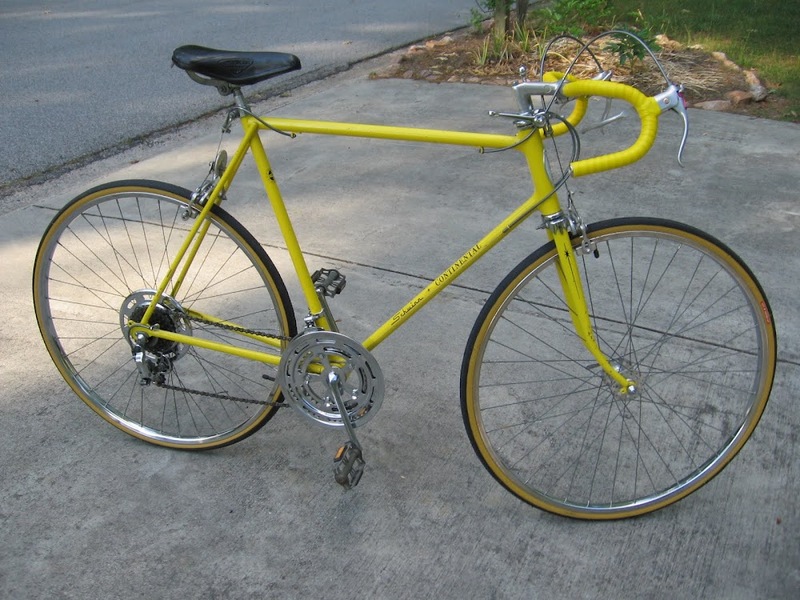 Mike D. has contributed quite a few bikes to the OTSG over the past couple years, but none quite as yellow as this 1972 Schwinn Continental. Haven’t sent you anything in a while – but here is my latest project. This Continental was completely torn down and overhauled. This thing is almost as heavy as my Miata, but it sure does ride smooooooth. I bought it from the original owner who hadn’t ridden it in 30 years. Love the Kool Lemon color! Truly a classic look in my eyes. This was the bike that I lusted over in my very early teens. 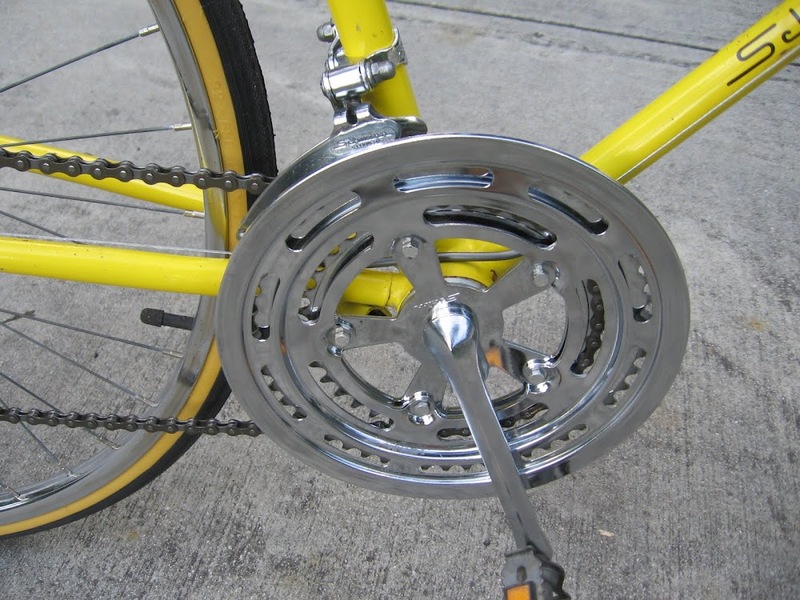 I mean after all, it had quick release hubs and center pulls – how cool was that??? As always, love the site and seeing the old machines that will still be around in another 40 years! 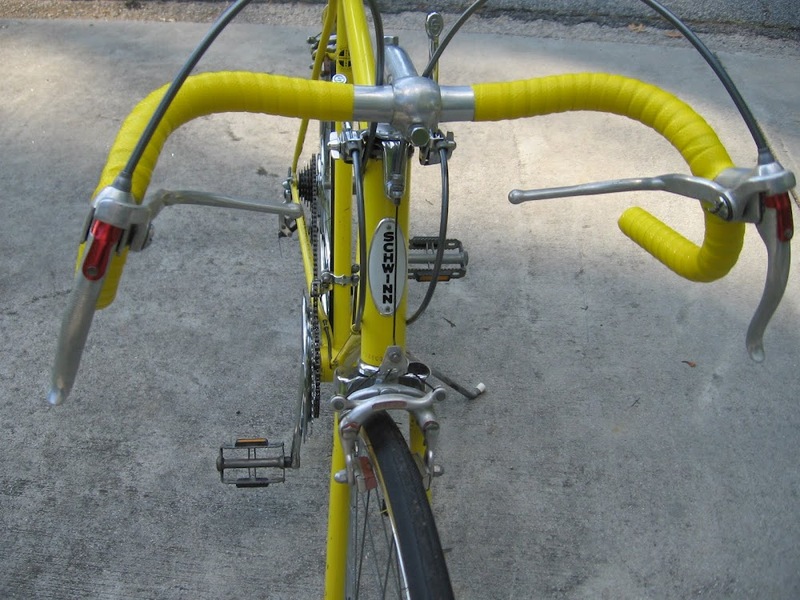 Mike D., WOW…a forty year old bike and nearly looking new! Isn’t it amazing to stumble across them? Anyone that is into bikes knows the feeling. I have found my fair share of scrap metal but every once in a while it is so rewarding to find something that is old and virtually unused. That Continental sure looks good and ready for another forty. Cameron, thanks as well for what seems like a plethora of cool mello-yellows lately. I still can’t believe how well these things ride! I have another one in the barn, same year and color, smaller frame, and this one has the chrome fenders, the Schwinn-approved generator light set front and rear, and the original Schwinn saddle bag hanging from the seat. Should be fun. A small picture is posted below, sans saddle bag. 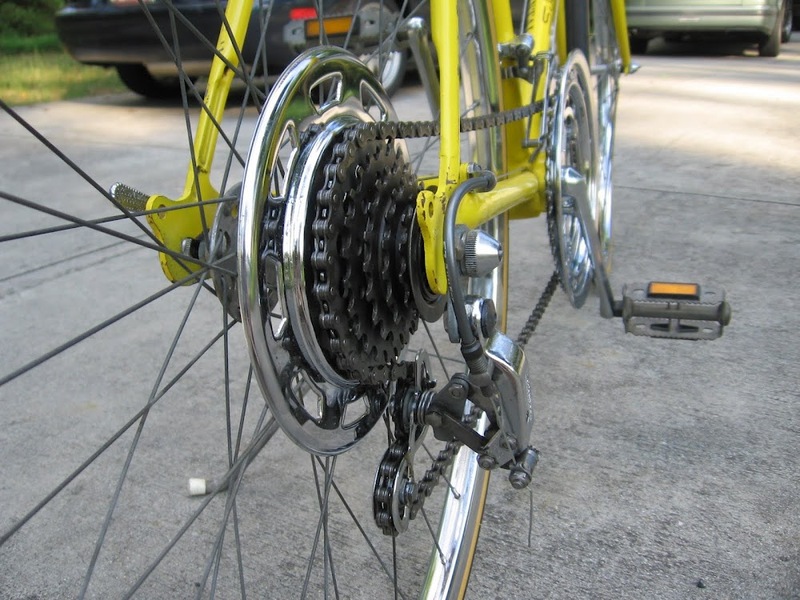 I have an incredible story about this bike – after I restore it I will share with OTS Gallery. Yes, many thanks to Cameron for providing this forum! Most times I would rather find a bike covered in crud. I know it sounds strange but when you begin to restore ’em all that dirt/oil/dust/road grime act as protectants covering and sealing a beautiful paint job that’s ready to glow with a little soap/water and wax. 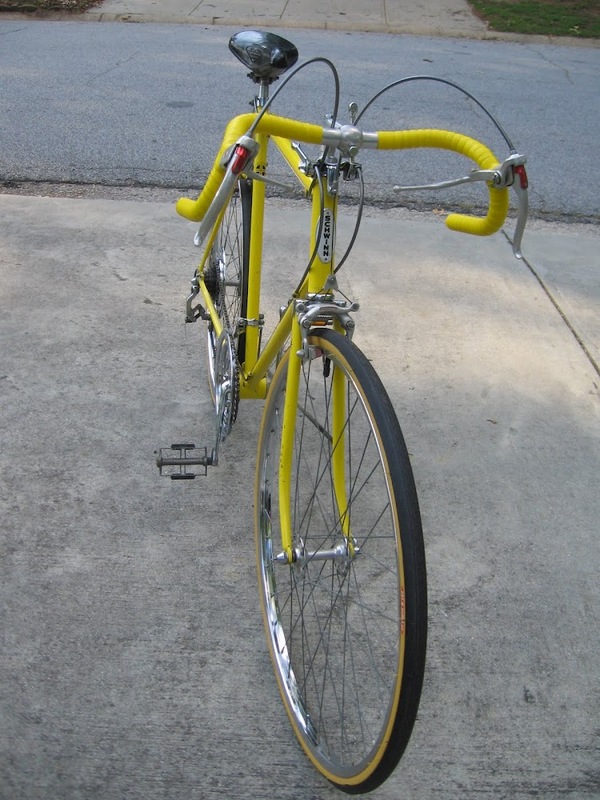 On the downside, I’ve had a few light colored bikes that were stained by grease being left too long on the paint. (that’s hard to remove) The other Continental waiting in the wings looks to be an equally nice candidate for resto’, will be looking for it. Mike, I am loving the Kool Yellow! I have my dad’s 1974 Schwinn Continental in opaque blue that I’m using for my workout bike. Last time he rode it was during a family bike ride sometime in the early 80’s. After that it was hung up in a shed where is sat until a couple months ago. No kids ever rode it. Beautiful shape. I replaced tubes, but the tires were still in great shape. On the front wheel I replaced bearings and cones. New handlebar tape. New brake cables, housings and pads. A new seat that fits my rear better, but I still have the original that can be put back on. Soap & water, degrease things a bit and it rocks. The fun thing is, my 7-year-old is riding the Schwinn Stingray that I rode at his age, which as been gone over and looks great. We will take the Schwinns out for a ride through the neighborhood where I grew up. Fun stuff. …sounds like someone rediscovered that biking can be fun. On an old vintage classic, well that’s just icing on the cake! Great stuff and I love the blue. Isn’t it amazing how these bikes hold up? Who needs this current aluminum stuff anyway? No style and no grace. These bikes will be around long after the current crop of bling is long gone! Even better that it was your dad’s bike.